Cliff Walker was born in 1941 in Tulsa, Oklahoma. He was commissioned a 2Lt in the U.S. Air Force through Officer Training School at Lackland AFB, Texas, in November 1963. Walker was then trained as a Deputy Combat Crew Commander for the launch of the Atlas F ICBM, and then went to Keesler AFB, Mississippi, for Communication Electronics Officer School. After completing Undergraduate Navigator training, he went through Electronic Warfare Officers training school and transitioned to the EB-66C aircraft. Walker began flying combat missions in the EB-66C with the 41st Tactical Electronic Warfare Squadron at Takhli Royal Thai AFB, Thailand, in November 1967. Captain Walker was shot down over North Vietnam on January 14, 1968, and was taken as a Prisoner of War. After spending 1,886 days in captivity, he was repatriated during Operation Homecoming on March 14, 1973. After hospitalization, he began flying as a Navigator on C-141 Starlifters at Travis AFB, California, and then the WC-130 Hercules out of McClellan AFB, California. Walker next went through Air Command and Staff College at Maxwell AFB, Alabama, and then went to Keesler AFB for Telecommunications Officers Staff School. In March 1978, he became Director of CE Logistics at the European Communications Division at Kaupan AS, West Germany. His next assignment was as Chief of Maintenance at the 2140th Communications Group at Hellenikon AB, Greece, from July 1981 to July 1983. 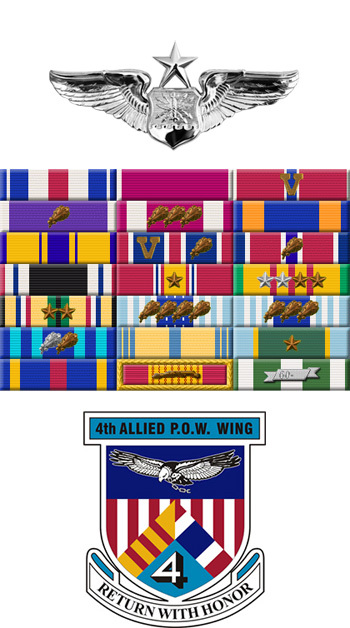 For the next year he was Director of Communications for the 7th Air Division at Ramstein AB, West Germany, and then in July 1984 he became Deputy Commander of the 1964th Communications Group, also at Ramstein AB. From July 1986 to July 1990, Col Walker served at the Standard Systems Division at Gunter AFB, Alabama. He next served as head of plans and programs for Headquarters European Communications Area at Ramstein AB, from July 1990 to July 1991. From July 1991 to July 1992, he served as Commander of the 2141st Communications Group in Ankara, Turkey, and then from July 1992 until September 1993 he was Director of Communications for NATO in Izmir, Turkey. 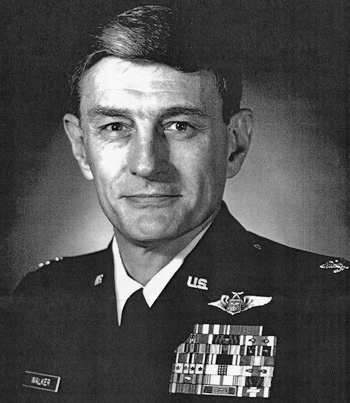 Colonel Walker retired from the Air Force on September 1, 1993. Cliff Walker wears Senior Navigator Wings and has flown as aircrew on the EB-66C Destroyer, C-141 Starlifter, and WC-130H Hercules aircraft. He married Vassiliki Theofilopoulou of Athens, Greece, on October 2, 1974, and they have one son, John. Captain Hubert C. Walker distinguished himself by gallantry in connection with military operations against an opposing armed force as an EB-66C Electronic Warfare Officer over North Vietnam on 13 January 1968. On that date, Captain Walker, by his outstanding display of professionalism and courage in the face of hostile fire from unfriendly forces, was highly instrumental in the overall success of the air operation. By his gallantry and devotion to duty, Captain Walker has reflected great credit upon himself and the United States Air Force.